Dubai, 7th November 2017: The UAE could be one of the happiest places in the world, as nearly half of us have admitted to playing every day, according to a poll* conducted by much-loved Swedish home furnishing retailer, IKEA. Nearly 100% of respondents in the UAE think that it is important to enjoy play as an adult, with many identifying happiness and positivity as the main reasons why. From utilising it to connect with friends and family (26%) to discovering new ways of doing things (24%), play is considered highly important for both children and adults. In order to enable a better everyday life at home, IKEA has looked into how important play is as part of its ‘Let’s Play for Change’ campaign. Through prior annual research, IKEA’s Play Report has determined the definition of play as ‘engaging in a light-hearted activity that is satisfying and spontaneous’. According to the poll, parents play with their children a lot too, with 67% saying they play together every day. In line with IKEA’s previous research that found the living room is the heart of the home, the poll uncovered that both children and adults consider it the best place to play! 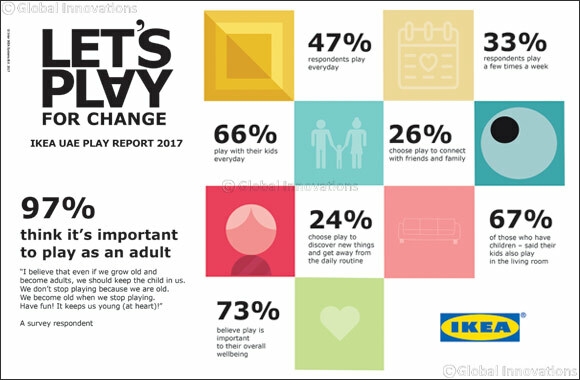 IKEA recently conducted its third global Play Report, exploring the importance of play for adults as well as children. The findings showed that play is a tool for people to sustain a healthy life, giving them room to be creative and making them happier. But people have also expressed that modern-day life is quick to steer people away from play and that it feels socially unacceptable to embrace a playful mind-set. IKEA wants to encourage you to make room this winter for more moments of celebration and play, and explore the child within. As part of the Let’s Play for Change campaign, IKEA will be hosting an exhibition, inspired by a magical playhouse fantasia, at Dubai Design District from 14th November - 9th December. It will also launch its global drawing competition from 16th - 26th November where children up to 12 years old get the chance to design toy that could become part of IKEA’s soft toy collection**.